A new Farm to table restaurant from Chef Tom Closter has hit the Long Island food scene, and it is phenomenal! I can confidently say that this restaurant is revolutionary in the best of ways. I loved the mission of this restaurant as soon as I heard it: a small menu restaurant that uses local and organic ingredients to create fresh, innovative meals. When I walked into Rustic Root a few weeks ago, I was smitten with the whole feel of it. It’s an earth tone venue with reclaimed wood tables, built by the Amish in Pennsylvania, and the exposed brick walls create a comfortably natural ambience. The restaurant features whimsical touches such as room dividers made from rolling pins. Overall it is homey and inviting…a real chic, rustic restaurant. In 2014, Thomas Closter, the present chef at Rustic Root, was named champion of the Food Network’s hit show “Chopped,” which if you have never watched is very entertaining. He has a reputation of being one of the most creative and passionate chefs around. Every meal he creates is given so much attention, which is not easy considering the menu changes seasonally, and the chalkboard-written specials are changed frequently. Closter’s attention to detail and the restaurant’s commitment to using local food is written all over the menu. 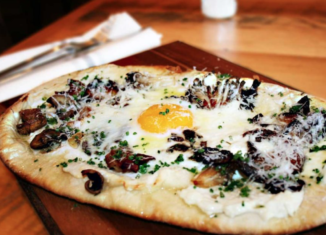 We started with the mushroom flatbread which was topped with the most delicious ricotta cheese I have ever tasted. The pecorino cheese on top gave it the perfect salty finish, and the right amount of truffle oil was used so the mushrooms could really shine through. My sister was at first reluctant to try the deviled eggs, something she would normally never consider, but was finally convinced to try them and ultimately said they were outstanding! I believe the eggs are from Kerber’s farm which has been providing eggs to the north shore for years. Next, we tried the cornbread which comes in a skillet. It was by far the tastiest cornbread I have ever had. After examining the list of entrees, I decided to go with the burger which was cooked perfectly and served with a side of salt and vinegar fries. YUM! My mom had the antibiotic-free lemon thyme chicken breast which she said was far better than any other normal chicken dish. It was paired perfectly with swiss chard and a side of chickpea fries, which I had never seen before. The menu also features plenty of vegan and gluten free options if you have dietary restrictions. There was no room for dessert, but my dad proceeded to order it anyway. Our server recommended the carrot cake which was huge and served in a mason jar; it was moist and full of flavor. The restaurant partners with nine local farms and businesses which is where they get their fresh maple syrup, grass fed beef, non-homogenized milk, and even sea salt from a local salt maker on the South Shore of Long Island. The owners and chef at Rustic Root want to educate the community about where their food is produced. They feel strongly that people should understand that although you may buy your food at a grocery store, that’s not its origin. They take pride in knowing the farms and farmers that produce their ingredients. If the restaurant doesn’t sound appealing enough yet, let me tell you about the staff: they are incredible! Everyone was friendly, knowledgeable, helpful, and passionate about the restaurant’s mission. It is very clear that the wait staff is trained to know everything about the restaurant, from the food to the history, so when they get to your table, they are able to make your time there the best experience possible. Rustic Root is open seven days a week for dinner. They are also open Monday through Friday for lunch and Saturday and Sunday afternoons for their delicious brunch menu. They are located at 7927 Jericho Turnpike in Woodbury, where Laguna Grill used to be. Their number is 516-364-5041. If you are looking for a local place with a comfortable rustic charm, an amazing staff, and fresh, innovative, high quality food, this place is definitely worth checking out.